We've just finished testing and have released version 5.98 of Syncdocs. This is a maintenance release. The main reason for this release is to be compatible with upcoming Google server and security changes. The next major release of Syncdocs (version 6) will be out beta in July. It contains many new features, will be faster and use less memory on 32bit systems. For those still using a username and password with Syncdocs, you will be forced to upgrade to Google app permissions, as Google is doing away with app passwords. 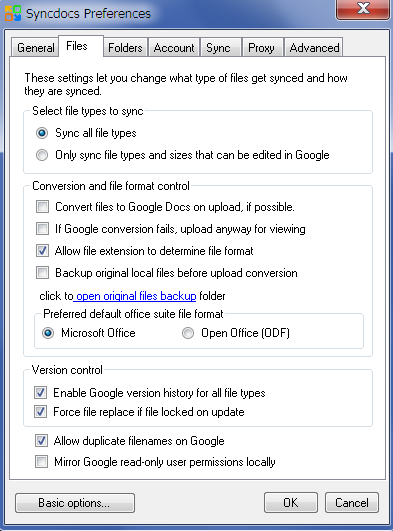 Syncdocs does this automatically, and you can learn more about the upgrade process here. For users of Windows XP and Vista, you may need to install .NET 4 as Syncdocs has upgraded to this over .NET 3.51. Windows 7 users who have not updated since 2011 might be prompted to download a Microsoft patch. Full details of this are here. We'll be releasing updated 64bit and portable USB stick version 5.98 in the next few days. but unfortunately I have to report that for me it keeps crashing after upgrading and giving Google app permissions to Syncdocs. Am running Win7 (64bit), with latest MS updates, and Bitdefender IS2015 (if this is relevant). Give it permissions to access the Internet through Bitdefender IS2015. The antivirus/firewall may have detected that the program (Syncdocs) changed and not let it access the Internet. If you still have problems, please send us the Syncdocs log, and we'll look into it quickly. You can get it by right clicking on the Syncdocs icon, selecting "Preferences", then "Advanced" and then "View Log". Thanks for the feedback and proposed actions. I have re-authorised the programme in Bitdefender (although it was allowing it to connect before already), and that did not fix the problem. Doing full slow sync as set not to allow duplicates. Hi, how can I force Syncdocs to open Google authorization window in a different browser engine? The 'Accept' button is inactive. Hi Pneumotube, What OS are you running? Syncdocs uses the operating system's browser, normally Internet Explorer. Google now requires at least IE version 8 to operate. Software environment is Win XP Professional and three browsers: Opera, Chrome and IE (I'm not sure about the version of it). I tried to make an IE a default browser instead of Opera, but it didn't work. I had too little time with that PC though. What can I check further? That button is just in a white-blue inactive state and 'Accept' text is highlighted but not pressed. Update: IE 7. We'll install IE 8. Thank you, installing IE 8 did help. Glad to hear that. Sorry about the IE 8 issue. The authentication needs to happen on Google's side and they don't support IE7 any more. Since updating to the 5.98 release, and switching to the OAuth authentication method, Syncdocs has stopped working on 2 of my machines. I have 1 other machine which works fine. All 3 machines are running Windows XP Pro (fully patched up to the last releases from Microsoft). The error log from one of the machines that isn't working is attached below. 14/04/2015 13:38:48(ver. 5.98) Failed to connect to Google Drive v2. Check your Internet connection. If your connection is OK, you may need to set up the Proxy Server settings. If this is not the cause, look at the error log in the Advanced tab in the Preferences menu. Inner: System.MissingMethodException: Method not found: 'System.Net.HttpStatusCode System.Net.Http.HttpResponseMessage.get_StatusCode()'. 14/04/2015 13:39:00(ver. 5.98) Error log dump info done. 14/04/2015 13:46:17(ver. 5.98) Error log dump info done. 14/04/2015 13:50:18(ver. 5.98) Failed to connect to Google Drive v2. Check your Internet connection. 14/04/2015 13:50:40(ver. 5.98) Failed to connect to Google Drive v2. Check your Internet connection. 14/04/2015 13:51:33(ver. 5.98) Failed to connect to Google Drive v2. Check your Internet connection. 14/04/2015 13:54:08(ver. 5.98) Error log dump info done. This is frustrating. I hope y'all figure this out quickly. I went back through the log, and identified the problem in my case - what was crashing Syncdocs5.98: file and/or directory name too long. Previous version just skipped the file from syncing; it seems this version crashes when encountering such an example. 1. Would it be possible to extend the current file / directory name limitations? 2. 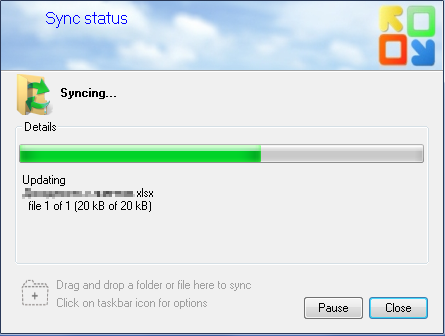 If a file fails to sync, this should be logged and reported in the window popup, but should not crash the programme. Yes, this version of Syncdocs regards path too long errors as a more critical error than the previous version, as the files are not downloaded. We will add the option to ignore these files and carry on with the sync. In the longer term, for the next version, we are working on support for longer file names. Unfortunately, this is a built-in Windows limitation of 260 characters, and bypassing it may never work on Windows XP. andrej: Please try the latest Syncdocs beta, which I've updated to be more tolerant of very long file name errors. I version 6.1, we will have the option of full long filename support, as long as the Syncdocs root folder is less than 200 characters from the root. Hi, I have a minor problem with the latest build (5.98.9810.4010). It happens only with .xlsx and .docx files and not with .txt. Syncdocs can't update these files after I save changes in them but (that's important!) don't close Excel or Word. Stays forever in this state: http://i.imgur.com/2wMFGYj.png even if I close a file in a minute after update starts. But if I change a file, save it and quickly close it, upload process is always performed correctly. I have to pause Syndocs manually and start it again to udpate a file. 16.04.2015 21:12:39(ver. 5.98) Error log dump info done. Pneumotube, dsg4 and andrej, thank you for the screen prints and logs, they were useful in tracking down the bug. You can get it from here, or the 64 bit version. 1. Fix for uploads and updates of files that are locked because they are in use by other applications. These can now be read and uploaded/updated/hashed. 2. Fix for very long pathnames where the directory name was between 244 and 259 characters, Syncdocs would crash. Thank you for a fast update. If I have installed a standard version of Syncdocs (not portable) on 64 bit OS should I install SyncdocsPortableInstaller64.exe? pneumotube: The standard version should run fine on a 64 bit OS. It might run in 64 bit mode, too, since it is both 64 and 32 bit in one .exe. But much depends the .NET libraries installed on the machine, so sometimes 32 bit code gets run on 64 bit machines. The portable 64 bit version forces 64 bit mode, and won't work on 32 bit Windows. The update problem is gone. Thanks again.